Read me in the magazine "Libres!" 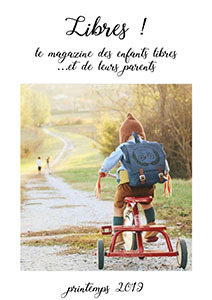 I’m honoured to be a contributing author of the French magazine “Libres!”, “the magazine of free children… and their parents”. In this Spring issue, I’m writing about our wonderful experience in a Forest playgroup, here in Germany. I’m so excited to welcome you today to this interview with the inspiring Lena from MoniMinis. Lena lives in Germany where I also currently live. Although we never met in person, I feel like she is a dear friend with whom I love to chat. Lena’s Instagram account and blog are real treasures, filled with wonderful ideas and inspiring posts. Spring is in the air and our cherry tree is preparing its buds for blossom. We hear the birds singing in our garden in the mornings and in the evenings. I’m trying to soak in every sound and colour and to print these moments in my memory as I know ... I know that this will be our last spring here, in this garden and in this house. We will be changing countries again. This is always a bitter sweet moment for me. And a reminder that only this moment counts. All we have is “now”. That’s why I’m determined to make the most of our spring. Enjoy this interview where Alison talks about balancing motherhood and work, nurturing ourselves as mothers and finding ways to support each-other. Alison will also share her sources of inspiration as a homeschooling mother. “Setsubun has been celebrated in Japan for thousands of years, on February 3rd, as a way to commemorate the end of winter (daikan) and the coming of spring (risshun). Though the days are still very cold with snow days ahead of us, it is a special time during which the concept of rebirth is celebrated, as nature gradually prepares for spring!” - Asumi from @littlemoments_tokyo. I want to share with you the beauty and the diversity of celebrations from different cultures around the world and about how families mindfully celebrate them. You might find inspiration in the way of preparing and authentically celebrating these festivals. Beyond rituals and traditions there are values. I am grateful to Asumi from @littlemoments_tokyo who accepted to share with us about Setsubun, the arrival of spring and beginning of a new year in Japan. I love Asumi’s page on Instagram and how thoughtfully she shares with her readers the beautiful and simple moments of life through the eyes of her daughter. This year we have decided to start a new family tradition and celebrate Candlemas (Chandeleur in French) on the 2nd of February. Candlemas is a festival of candles and stands for the return of the light and the spring after the cold, dark winter. Today at Mothers’ Voices I am delighted to share with you the story and the wisdom of the wonderful Simon Davies, a mother of teenage children who is also an inspiring writer and Montessori teacher. Originally from Sydney, Australia, Simone is running her own Montessori happy place, the Jacaranda Tree Montessori in Amsterdam, the Netherlands. In this interview, Simone is sharing with us the most helpful principles of the Montessori philosophy that worked for her children over the years, what we do differently when we “Montessori at home” than in schools, the importance of living the values we preach and tips for the inner work that we, as parents, need to do when raising children. With a little one coming soon in our family, I have obviously reflected a lot on … siblings. And inescapably, on sharing. My daughter has lived the first 4 years of her life as the only child and the first 3 years, as the only grand-child on both sides of our family. And now, here comes a sibling. She has to share with him our space, her toys, our time and even us, her parents. Everything! Everything? From a very young age, children are expected to share. I think that the word “share” is the most used word in regular gatherings, playgroups, playdates and on the playgrounds. I have already written here about our Gratitude Calendar this year and I have received questions and requests to share how this calendar looks like. I’m happy to show you how I made it. Together with our Winter Books, the Christmas books are very much loved and read during the cold, dark evenings or the snowy mornings. Going through our Winter Books I have realized that this is the biggest pile of the seasonal books, probably because in wintertime we also spend even more time reading, especially when it gets dark already around 3 pm. For this blogpost, I have organized the books in 5 categories: books without text, fiction, non-fiction, Japanese authors and Christmas books. Today at “Mothers’ Voices” I’m welcoming Sophie from “Chroniques d’une Globe-têteuse” . We are talking about how to “Montessori” at home, the rhythm of their days when Lynne attends the Children’s House and during the week-end, the challenges of multicultural families, self-care and so much more. At the approach of Christmas, Hanukkah and other festivals, the pressure is big to buy more, own more, do more. But we don’t necessarily need to give in and follow this trend. There is so much that we have already, own already, do or are already. Mindfully acknowledging these things is already enough. So this year, I’m preparing a Gratitude Advent Calendar again and I want to share it with you. Today let’s learn more about Hannukkah, who starts this year on the evening of the 2nd of December. My interview for "Hello Maman"
I have had the joy to be interviewed by Charlotte who writes an inspiring blog “Hello Maman” on slow parenting, homeschooling and motherhood. We talk about my parenting style, books that inspire me, also about how I homeschool my daughter and a topic dear to my heart: PLAY. I’m so excited to start again my series of interviews Mothers’ Voices that I have initiated in 2015 and delighted to have Lisa Winter from “mama.rainbow.skies”, Glasgow, Scotland as a guest today. I came across Lisa on Instagram and each time I connect and see her bright, colorful pictures, I feel inspired. I particularly love Lisa and her daughter Cleo’s universe and Cleo’s way of peacefully playing indoors or outdoors, lost in deep concentration. Lisa is based in Scotland where she raises her “rainbow child” and she has previously lived in Dubai and Athens. In this interview we talk about homeschooling and her sources of inspiration, how she chooses Cleo’s materials and toys and how she gets motivated to go outdoors by any kind of weather. Lisa will also share with us what self-care means to her and how she finds support in her motherhood journey.